A march was held in central Moscow on Sunday to mark two years since Russian opposition figure Boris Nemtsov was shot dead on a bridge next to the Kremlin. Police said some five thousand people took part in the march, according to Interfax and TASS news agencies. The march commenced at 2pm Moscow time and lasted two hours. The participants walked from Strastnoy boulevard to Akademic Sakharov prospect in central Moscow. They will also lay flowers at Bolshoi Moskvoretsky Bridge, where Nemtsov was murdered. 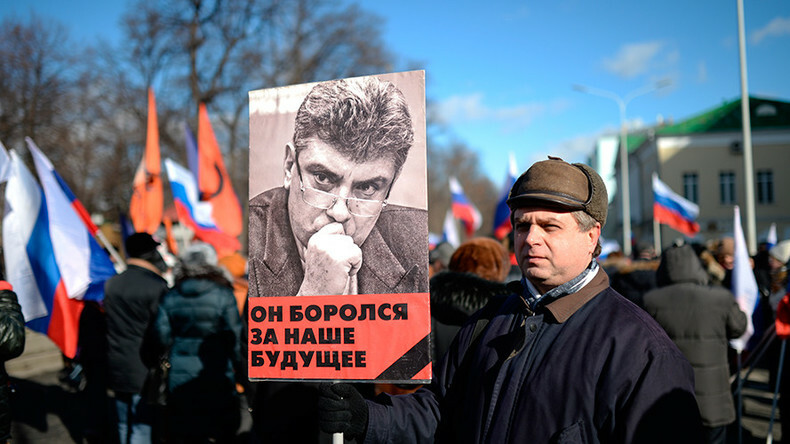 According to the organizers, the march’s aim was to pay tribute to Nemtsov and show solidarity with his ideas. One of the marchers, chairman of the Parnas opposition party, Mikhail Kasyanov, was splashed in the face with a brilliant green solution during the march, but did not leave the demonstration. Police say no other serious disturbances were reported. Nemtsov was walking with his girlfriend in downtown Moscow near the Kremlin late in the evening of February 27, 2015, when he was shot dead while crossing the Bolshoi Moskvoretsky Bridge. An assailant in a car shot the 55-year-old opposition figure in the back four times. A thousands-strong march was held in the Russian capital in 2015, and again on the first anniversary of his death in 2016, with the public demanding that his killers be found and punished. Russian President Vladimir Putin pledged in a public address following the murder that those responsible for organizing and carrying out the crime would be punished. Five people are currently under investigation for Nemtsov’s murder. Zaur Dadaev, Shadid Gubashev, Anzor Gubashev, Temirlan Eskerhanov, and Khamzat Bakhaev are accused of murder for hire as part of an organized group. According to the Russian Investigative Committee, Ruslan Mukhutdinov, who is suspected of being the organizer of the hit, and several other unidentified persons offered Nemtsov’s suspected killers at least 15 million rubles (around $250,000) to carry out the murder. One of the suspected killers, Dadaev, reportedly told investigators last year that the murder had been carried out in revenge for Nemtsov making “negative comments on Muslims and Islam” and publicly condemning the Islamists who killed journalists working for Charlie Hebdo magazine in France in January of 2015. Those who were close to Nemtsov consider the case far from closed, however, claiming that the real organizers of the murder have yet to be found. Boris Nemtsov was a regional governor and a deputy PM under President Boris Yeltsin. He became an opposition politician in the early 2000s and held a seat in the legislature of central Russia’s Yaroslavl Region from September 2013 until his death.